I’m generally quite sold on Eyeko polishes… and for the money, since the reformulation last year they’ve been a good bet. I’m particularly a fan of their pastels which can often be hit or miss from all brands thanks to streakiness, thickness of formula to overcompensate or just downright chalkiness. Not only that but the formula is easily spreadable. The only area this polish fails a little for me is patchiness. Whilst not horrific, you can see that after two thick coats… it could do with a third. There is uneveness and a bit of streakiness going on here. The pale blue has a gorgeous vivid flash of metallic blue pearl which stops it from looking flat. If you’re willing to go with three coats on this shade, it’s a total winner in my book. Eyeko Pastel Polish is available to buy online priced at £3.50 from PowderRooms or £4 direct from Eyeko. I always struggle with the formula but I dearly love this shade! I will buy myself at least 2 back ups for this summer! I also believe this to be an excelent dupe for Chanel Riva. I like Eyeko polishes, I don’t have this colour though. It’s very pretty, definately ‘nice nails’! Is it wrong/worrying I’ve come to associate makeup with all other things good in life, like yummy easter eggs? Super pretty. I was thinking of buying this. Thanks. 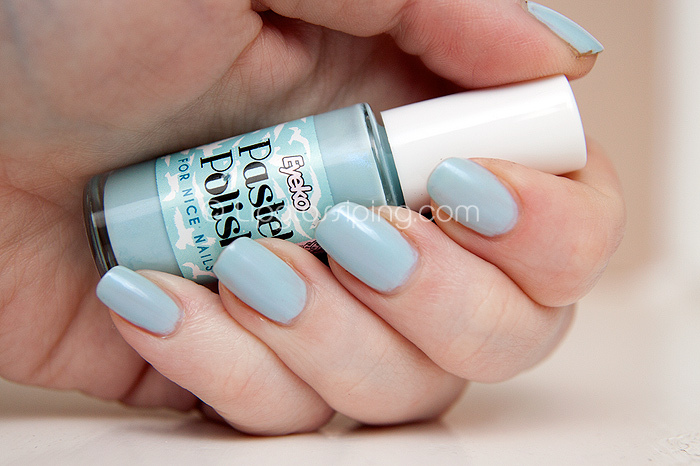 I just applied Essie’s Smokin’ Hot and now immediately want to replace with a pastel blue like this! Pretty!